Around 820 a magnificent copy of the Psalms was produced in the Rheims area, densely illustrated with a series of drawings in pen. These drawings still astonish by their lively, animated character, arranged almost informally around the text on the page. This Carolingian manuscript, known as the Utrecht Psalter (from the city where it has been since 1716), contains the three Latin versions of the Pslams. It was in Canterbury from at least ca 1000, where three copies or modernized versions of it were made. This leaf comes from one of them, a major Psalter with a prefatory portrait of the scribe Eadwine, a monk at Christ Church, Canterbury ca1155-60. This is one of the introductory leaves to the Psalter; each leaf was divided into compartments to tell the story of King David, the author of the Psalms, and the life of Christ that was foretold by the Psalms. 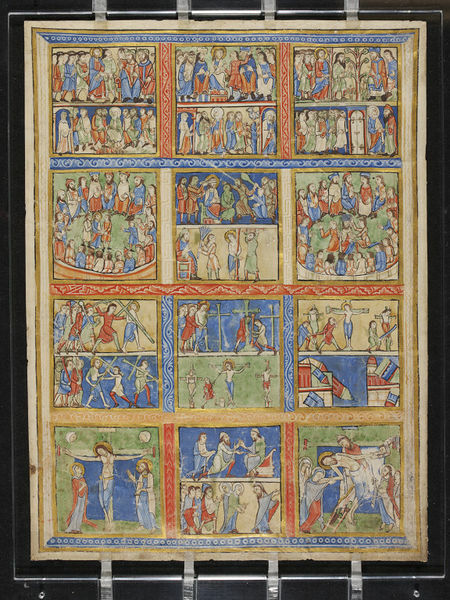 This was the most extensive cycle of pictures for the New Testament produced in twelfth-century England. Though a few of the compositions are related to drawings in the Utrecht Psalter, the style owes nothing to the Carolingian manuscript. The Canterbury copy has a limited range of colours. The figures are stocky and locked in monumental poses to convey the drama of the action. The convention used for the drapery is known as 'damp fold', a version of Byzantine conventions common throughout Europe from ca.1100. The lower part of the leaf is a different hand, showing that more than one illuminator could work in this style. Four leaves were probably detached from the Eadwine Psalter at some time around 1600, when Thomas Nevile, Dean of Canterbury from 1597 to 1615, gave the Psalter to Trinity College, Cambridge, where it remains today. Manuscripts of this date were not generally admired, despite the rich decoration in this particular example. However, its evident antiquity attracted those who were interested in the origins of Britain. By the nineteenth century, these leaves belonged rather oddly to the collection of William Ottley (1771-1836), who saw the High Renaissance as the summit of art. In 1838 they were described as 'Saxon work, 11th century' - a barbarian curiosity and a suitable foil to later works which showed how Giotto emancipated art and set it on a route that was to lead to Raphael and his peers'. The page consists of a series of illustrations, arranged in small compartments, showing scenes from the New Testament. The leaf is painted on both sides with twelve scenes on either side. The leaf was bought from Charles Fairfax Murray for £50 on the 31st August 1894. From 'The Medieval Treasury: the art of the Middle Ages in the Victoria and Albert Museum'; edited by Paul Williamson; Victoria and Albert Museum; 1986. This is one of the four surviving leaves, painted on both sides (the others are in the British Library and in the Pierpont Morgan Library, New York) which, between them, contain by far the largest series of New Testament illustration in England or anywhere else in the twelfth century. 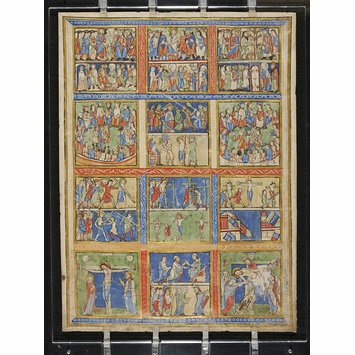 Only a few of the Old Testament scenes survive, but the Gospels are illustrated with about 150 scenes, each very small and simplified but clearly related to the miniatures in two other manuscripts, the St. Albans Psalter and the New Testament in Pembroke College, Cambridge. All three were probably derived from a common model similar to the eleventh-century German cycles from Echternach, which also contain several of the rare illustrations to the Parables and the Miracles. However, the four leaves contain a greater proportion of scenes than any of the Echternach manuscripts - and it is conceivable that they echo early Christian cycles of the kind contained in the sixth-seventh century Gospels in Corpus Christi College, Cambridge. In any case, on the evidence available it is highly improbable that these scenes were invented for this particular manuscript. The same series of illustrations, also arranged in small compartments, appears in a late twelfth-century Psalter from Canterbury, and hence it may be assumed that these leaves also originally prefaced a Canterbury Psalter. Containing a calendar and prayers as well as the Psalms, the Psalter was the central prayer book of the period for monks, clergy and laity alike. It was in England that the practice grew up of prefacing the Psalter text with Bible illustrations. What is unique about these leaves at this period is the profusion of tiny scenes giving the effect of a twelfth-century comic strip. A close look reveals that the two halves of the recto (colour plate) are by different artists. The upper half is cruder, characterised by profiles of the St. Albans Psalter type; the lower half is in a more sophisticated style linked in details, such as the treatment of curly hair and beards, with the great Bible at Lambeth Palace. 400 x 300 mm; width of painted area 283 mm, including frames. Watson, Rowan. Illuminated manuscripts and their makers. London: V&A Publications, 2003. 144 p., ill. ISBN 185177385.
of images recounting the life of Christ. rather than the performance of the liturgy.